Cabbage juice can be made from several different types of cabbage. Cabbage (or headed cabbage) is a member of the Brassica oleracea species that also includes kale, broccoli, Brussels sprouts, and cauliflower. Popular varieties of cabbage juice include red cabbage juice, fermented red cabbage juice, and cabbage extract. There are also juice blends that include cabbage juice. The nutritional benefits of cabbage juice depend on the ingredients in the juice that you drink. though almost all of the calories come from carbohydrate, there are so few calories in the juice that this can still be considered a low carb food (beverage) because there are only two grams of carbohydrate per serving. Carbohydrates in cabbage come from starch (2.2 grams in a one-cup serving) and naturally-occurring sugar (2.8 grams per serving). If you make cabbage juice at home, you are likely to use several cups of cabbage and possibly even a full head of cabbage to get enough juice for one serving. Juicing eliminates fiber, so the carbohydrates in your cabbage juice would come from sugar alone. A large head of cabbage may have up to 40 grams of sugar. It is possible that you will consume more carbohydrate from sugar if you buy a cabbage juice that is blended with other juices—especially fruit juices. The glycemic index of cabbage is one—making it a low glycemic food. The estimated glycemic load (GL) of one cup of raw cabbage is approximately two. Glycemic load takes into account the serving size of a given food or beverage to estimate the food's impact on your blood sugar. It is considered to be more helpful than just using glycemic index for people who are choosing foods based on their effects on blood glucose. The estimated glycemic index and glycemic load of cabbage juice may be slightly higher than it is for cabbage because the fiber is removed during the juicing process. There is no fat in cabbage juice. Even if your cabbage juice is made commercially with other ingredients, it is not likely that you'll get fat from drinking the beverage as most fruits and vegetables that are likely to be in a juice drink do not contain fat. There may be protein in your cabbage juice depending on how much cabbage is used to make the juice. A single cup of raw cabbage provides about one gram of protein. But if you use a medium head of cabbage to make your juice, you may benefit from up to 11 grams of protein. Whole raw cabbage contains important vitamins and minerals. So the juice will most likely provide these micronutrients when you drink it. If the beverage is a blend that includes other greens (such as kale spinach, broccoli) or fruit (apples or citrus fruit), you'll likely benefit from additional vitamins and minerals depending on the ingredients. One cup of raw cabbage provides 54 percent (32.6 mg) of your recommended daily intake of vitamin C. Foods with vitamin C (L-ascorbic acid) are essential for good bone structure, cartilage, muscle, and blood vessels. You'll also benefit from 85 percent (68 mcg) of your recommended intake of vitamin K, a fat-soluble vitamin that helps with blood clotting functions in the body. A cup of cabbage also provides 10 percent of your daily recommended intake of folate, and 6 percent of your daily intake of vitamin B6. A serving of cabbage provides 7 percent or 0.1 mg of manganese, a vitamin that boosts nervous system and brain health. 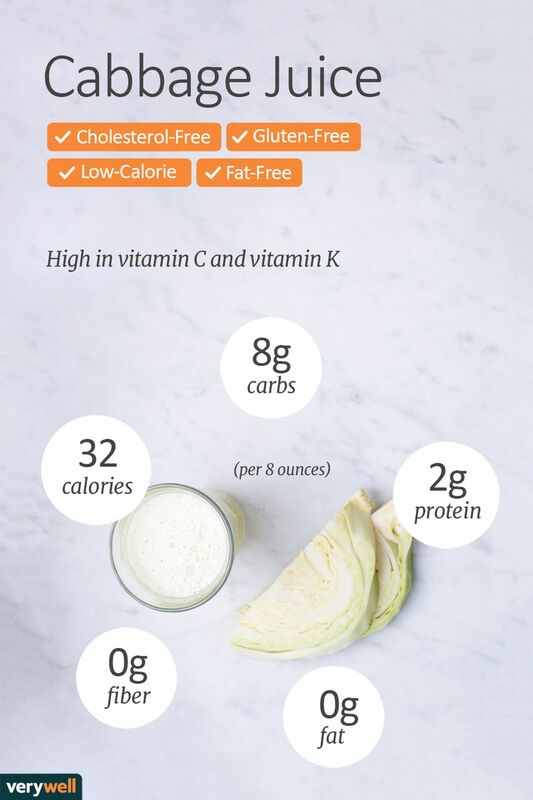 Other notable minerals contained in cabbage juice include calcium (35.6 mg or 4 percent of your recommended daily intake) and potassium (151 mg or 4 percent of daily needs). Cabbage juice benefits are widely promoted on websites and in health magazines. But not all of the purported health benefits are supported by strong scientific evidence. For example, several websites promote drinking cabbage juice as a method to reduce and manage ulcers. Some people consume raw cabbage or cabbage juice for gastritis, gastric pain, or gastroesophageal reflux disease (GERD). One scientific study dating back to 1949 provides evidence that eating cabbage may speed healing of stomach ulcers. However, current evidence is lacking to support the use of cabbage or cabbage juice to treat ulcers, stomach pain or stomach acid, according to the Natural Medicines Database. Some websites also promote cabbage juice as a tonic to prevent cancer. But there is no convincing evidence to support the use of cabbage as a juice or whole vegetable to prevent bladder, colorectal, stomach, pancreatic, prostate, or lung cancer. There is also insufficient evidence to support the use of this tonic to reduce cholesterol or prevent osteoarthritis. Foods, like cabbage and cabbage juice that are high in vitamin C may provide important medical benefits, but according the National Institutes of Health, "ongoing research is examining whether vitamin C, by limiting the damaging effects of free radicals through its antioxidant activity, might help prevent or delay the development of certain cancers, cardiovascular disease, and other diseases in which oxidative stress plays a causal role." Lastly, some cabbage juice drinkers use the beverage to relieve breast engorgement during breastfeeding. While there is evidence suggesting that placing whole cabbage leaves on the breasts may relieve symptoms, there is no evidence to support drinking juice to get the same effect. What should I look for when purchasing cabbage for juice? Cabbage is inexpensive and easy to find at your local grocery store. Look for heavy, compact heads with bright green or red leaves. Leaves should also be crisp and not wilted. Avoid cabbage heads that have cracks in the base. What is the best way to store cabbage? When you bring cabbage home, keep it dry and store it in an airtight container in the refrigerator. Cabbage should stay fresh (uncut) for about two weeks. Once the head is cut, wrap it tightly with plastic wrap to keep it from spoiling. Is cabbage juice just as healthy as fresh cabbage? In general, eating whole vegetables is better for your body than consuming juice. Whole fruits and veggies usually contain less sugar and more fiber than drinking juice. Whole cabbage, for example, provides 2-3 grams of fiber per serving that you miss out on when you drink cabbage juice. However, if you are trying to increase your intake of certain vitamins (like vitamin C or vitamin K) the juice may provide a higher concentration than eating a single serving of the food. Is fermented cabbage juice healthier? Fermented foods provide probiotics which are believed to aid in digestion and the maintenance of a healthy digestive system. Fermented cabbage juice is a good source of probiotics. While scientists aren't certain that fermented foods can provide substantial health benefits, there is emerging evidence that points in that direction. There are different cabbage juice recipes and variations, but most follow the same basic steps. Add the vegetable to several cups of boiling water and boil until the vegetable is soft. Place the cabbage and the water into a blender. Blend on slow speed, gradually increasing to high for 20-30 seconds. If you prefer, add ingredients such as kale, cucumber, apple, cilantro, spinach, or citrus fruit for flavor. Cabbage allergies are rare, but there is at least one case study of a woman who was found to have two anaphylactic episodes after ingesting broccoli, which belongs to the same mustard/cabbage Brassicaceae family. Some experts advise avoiding cabbage if you are allergic to any member of Brassica species. Cabbage may reduce acetaminophen levels in the body if you consume the food on a daily basis. So if you regularly take a medication like Tylenol, you may want to cut back on your cabbage intake. In addition, if consumed in large quantities, cabbage might decrease the anticoagulant effects of warfarin due to its high vitamin K content. There is moderate evidence suggesting that consuming large quantities of cabbage may interfere with medications such as oxazepam (Serax), glucuronidated drugs, multiple medications involving cytochrome P450 1A2 (CYP1A2) substrates and some antidiabetes drugs. If you are on a medication and you plan to consume large quantities of cabbage or cabbage juice, speak to your health care provider to minimize the risk of a potential drug interaction. Cheney G. Rapid healing of peptic ulcers in patients receiving fresh cabbage juice. Calif Med. 1949;70(1):10-5. Vitamin C. National Institutes of Health Office of Dietary Supplements. Fact Sheet for Professionals. What Are the Health Benefits of Drinking Orange Juice? Is Drinking Ginger Juice Good for Your Body? Are Pomegranates Really Good for You? Why Is Kale Considered So Healthy for You?